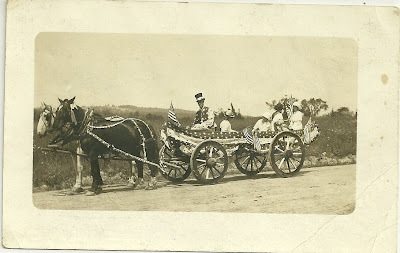 Just in time for 4th of July 2010, here's a memento from an earlier time - a horse-drawn float that participated in the 4th of July parade at Harmony, Maine, or nearby, in 1913. 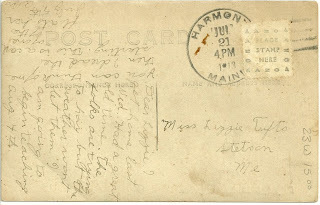 The card, postmarked July 21, 1913, Harmony, Maine, was addressed to Miss Lizzie Tufts, Stetson, Maine. Sadly, I can't quite decipher the name of the sender, whether male or female. I got home last Wed. Had a great old time. The folks are trying to hay but the weather won't let them. I am going to begin teaching August 4th. You can think of me then. I dread the starting. This is a card of one of the floats here July 4th. [Signed: name illegible, but possibly Alma or Allie or Abbie perhaps a man's name]." I'm looking for a listing of teachers in Harmony and neighboring towns for the year 1913. There was an Alfreda Ann Hatch, born in 1878 in Harmony, quite a bit older than Lizzie. She was involved in the Kingdom movement at Durham, Maine and was a teacher. She was the daughter of Stedman & Julia Ann (Macomber) Hatch, but I believe the Hatch family had moved from Harmony to Durham in 1901. Not a likely candidate perhaps. Lizzie Tufts was born in 1894 in Etna, Maine, which abuts Stetson; she was the daughter of Edward and Nella or Nellie or Ella Tufts. They apparently married before 1892 as they are not in the Maine Marriages database. I believe that Edward was the son of Elias and Nancy Tufts. I was hoping to get a better handle on the genealogy in order, perhaps, to find a cousin to Lizzie who lived in Harmony. If you have any thoughts as to the identity of the writer, given his or her friend or relative Lizzie Tufts, I would love to hear from you. In the meantime, enjoy this memento of the 4th of July, rural style. Thanks for stopping by!